​A manicure consists of filing, shaping of the free edge, cuticle treatments, massaging of the hand and application of the polish. In addition, the soaking in a softening substance and the application of lotions are common specialties. ​A pedicure is a way to improve the appearance of the feet and their nails. The word pedicure comes from the Latin words pendis, which means of the foot, and cura, which means care. A lightweight plastic plate that follows the shape of the nail is glued to the tip of the natural nail in order to add length. Acrylic, gel, fibreglass or another mixture is then applied on top of the extension and is usually ‘cured’ in order to secure the extension and add strength and shine. These colors are flawless wear, superior and mirror shine with zero dry-time and no nail damage! They allows your nails to stay healthy and strong while maintaining the chic shine of a salon service. Nails filed and shaped, cuticles soak, pushed back and trimmed, nails buffed, hand massage, your perfect choice of nail pain with OPI Nail envy strength. Nails filed and shaped, nails buffed, your perfect choice of nail paint with OPI Nail envy strength. Soak off foot in American foot spa, nail filed, softening cuticles, pushed back and trimmed, nails buffed, removal of callus skin, exfoliation, smooth massage and your perfect choice of nail paint with OPI Nail envy strength. For those who are pushed for time this service offers a file, shape, buff and Gel/Shellac polish and back to work. We are a professional nail & beauty salon located on Welford Road in Leicester. 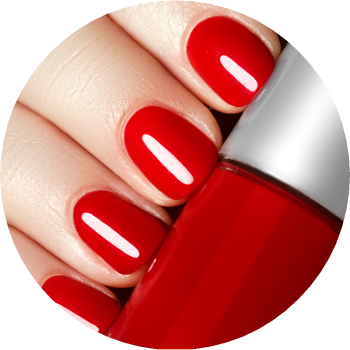 We provide a range of nails care and all our technicians are fully trained in the treatments they provide.